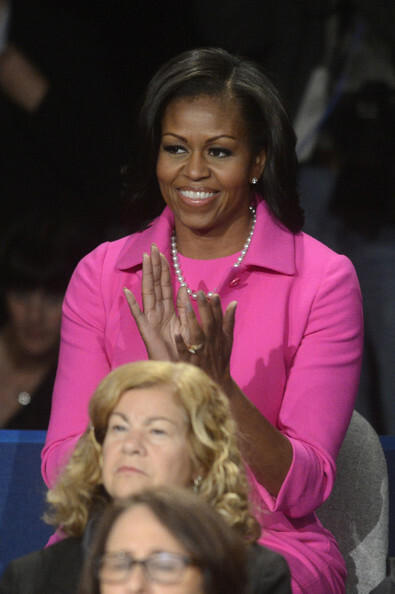 First lady Michelle Obama sits in the audience before the start of the presidential town hall style debate at Hofstra University October 16, 2012 in Hempstead, New York. *Michelle Obama will take her campaign hustle to “Jimmy Kimmel Live” next week, marking her first appearance on the late night show. The Obamas have been more active on the late-night circuit of late than the Romneys, with President Obama stopping by “Late Night With David Letterman” and “The Daily Show With Jon Stewart,” which airs tonight. Mrs. Obama will appear on “Live with Kelly and Michael” on Friday.